In three experiments we attempted to extend the cognitive-effort account of depressive deficits in memory to naturally depressed college students. 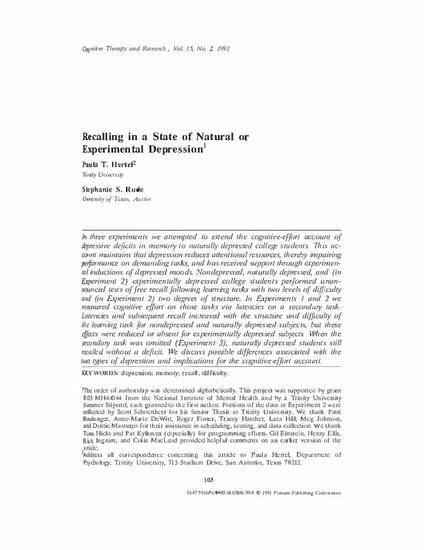 This account maintains that depression reduces attentional resources, thereby impairing performance on demanding tasks, and has received support through experimental inductions of depressed moods. Nondepressed, naturally depressed, and (in Experiment 2) experimentally depressed college students performed unannounced tests of free recall following learning tasks with two levels of difficulty and (in Experiment 2) two degrees of structure. In Experiments 1 and 2 we measured cognitive effort on those tasks via latencies on a secondary task. Latencies and subsequent recall increased with the structure and difficulty of the learning task for nondepressed and naturally depressed subjects, but these effects were reduced or absent for experimentally depressed subjects. When the secondary task was omitted (Experiment 3), naturally depressed students still recalled without a deficit. We discuss possible differences associated with the two types of depression and implications for the cognitive-effort account. Hertel, P. T., & Rude, S. (1991b). Recalling in a state of natural or experimental depression. Cognitive Therapy and Research, 15, 103-127.